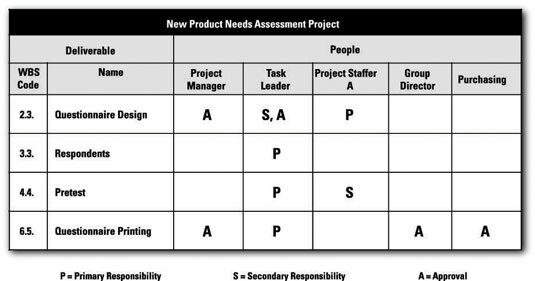 One way you can display team roles and responsibilities is in a Responsibility Assignment Matrix (RAM) — also called a Linear Responsibility Chart (LRC). Defining and sharing team roles and responsibilities upfront can help you improve performance and identify and head off potential difficulties during any project you are managing. Project deliverables are in the left-hand column. Project audiences are in the top row. The role each audience will play in performing the work to produce each deliverable is in the intersections of the rows and columns. Primary responsibility (P): You’ll ensure the results are achieved. Secondary responsibility (S): You’ll ensure some portion of the results is achieved. Approval (A): You’re not actually working on the deliverable, but you approve the results produced by others who are. Review (R): You review and comment on the results of an activity, but your formal approval isn’t required. Output (O): You receive products from the activity. Input (I): You provide input for the activity work. The roles included in a project RAM describe the work different people must do to help accomplish the project activities. To help your team members increase their contributions to the entire team as well as the quality of their own work, base their project assignments on their skills, knowledge, and experience and on the behaviors they tend to exhibit on tasks they perform.